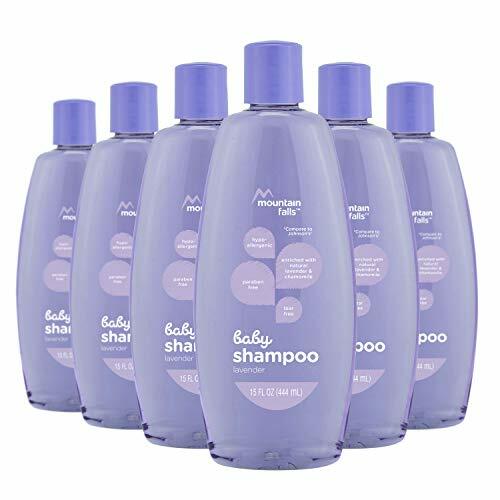 When it comes to choosing a shampoo for your little one, we are sure you are going to agree that the main factors in picking a particular product are; value for money, chemical-free ingredients and tear-free properties. Shampoos that have chemical ingredients in them can lead to dry skin, itching and even possible hair loss due to an allergic reaction. Why Choose a Chemical-free Shampoo Even if it’s More Expensive? The fresh Monster brand was developed by two mothers who wished to create 100% natural and toxin-free shampoo for the ir children. Together, they have worked for a top hair care label for over a decade, however, when they both became mothers and looked for a chemical-free shampoo they found themselves swamped with harmful ones. In less than 3 months, Fresh Monster was born. They created the patented formula under a watchful eye of dermatologists, pediatricians, and chemists. As a result, they have managed to come up with one of a kind product on the market to this day. The shampoo they have created can conveniently double as head to toe washing up liquid. It is made using only natural, toxin-free ingredients that are bought at a fair price locally. Plus, it does not contain any parabens, sulfates, phthalates and colorants or preservatives. It’s vegan certified and contains no traces of gluten, nut or soy. It was certified by PETA as cruelty-free as its testing does not involve animals. It derives its light scent from the many botanical extracts that it is made out of. The bottle is made using biodegradable plastic and comes with an easy to use pump that can easily be used by the kids. 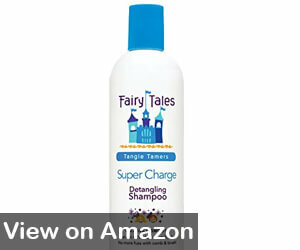 Fairy Tales Super Charged Shampoo is natural, jojoba oil infused shampoo that gently detangles fine hair in small children and acts as an anti-fungal and anti-bacterial shampoo preventing bacteria growth in the hair follicles. 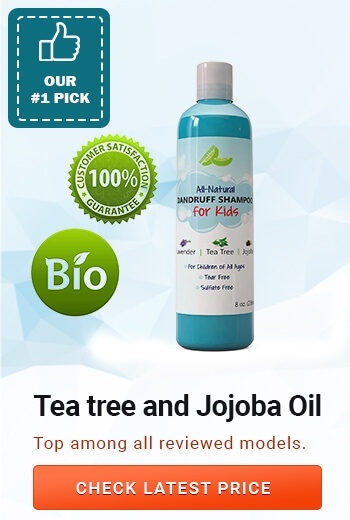 Jojoba oil is often credited by dermatologists as a number one moisturizer and many mothers massage their babies scalp on daily basis using a small amount of warm jojoba oil. Fairy Tales source their jojoba oil from local Indian farmers-by purchasing this shampoo; you will be supporting this fair trade as well. The added vitamin B and E hydrates and nourishes the tender scalp preventing cradle cap, redness, and itchiness. It is made to be of a thick consistency and a small amount goes a long way as it tends to foam into a rich, creamy lather. Aloe vera juice slightly scents the shampoo and gives it a nice green color. Fairy Tales Shampoo has been tested by dermatologists and approved to be used on sensitive and problem-prone skin, including on newborns. Its tear-free formula ensures that your little one can play with soap bubbles without fearing that it will sting their eyes. Use it on damp, tangled hair to get a smooth, rich lather that will wash away sweat, dust, and dandruff away with ease. You will be happy to know that its formula does not include gluten, soy, or dairy traces. The added keratin helps repair, condition and strengthen the hair strands. Dandruff occurs in children as well as adults, and buying a specialist anti-dandruff shampoo is the best solution. This shampoo is very similar to other alternatives as it is eco-friendly, chemical free and is enriched with botanical extracts to enhance its already strong formula. It stands out, however, because of its tear-free and anti-dandruff properties.The essential extracts such as Chamomile and Lavender are locally grown and are purified over several stages. Chamomile helps soothe the scalp skin preventing itchiness and flaking of the skin. All ingredients go through strict cruelty-free testing, as well as quality control at a state-of-the-art facility in Houston making it one of the best anti-dandruff shampoo for children on the market. HoneyDew Anti-Dandruff Shampoo has been certified as non-toxic, hypoallergenic, organic, and gluten-free. Give your child a soothing bath before bedtime and they will fall asleep much better as lavender scent has a calming effect. It comes in elegantly designed bottles that are easy to carry if you are traveling. It comes without a pump, but under the cap, you will find a handy bottleneck that will make squirting the desired amount a no hassle ordeal. Suave, a US made shampoo that doubles as a hair conditioner too. 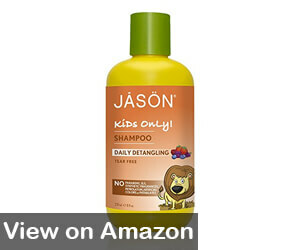 Dermatologically tested and certified as anti-dandruff shampoo suitable to be used on children of all ages. The formula does not contain parabens, SLS, and preservatives and is thus certified as hypoallergenic (Source). Moreover, it is enhanced with Manuka Honey that has strong anti-fungal properties preventing a number of fungal hair diseases. It is best to be used on children that sweat a lot and wear head gears, such as, baseball caps or helmets. Cehami extracts reduce the itching and help calm the irritated scalp. 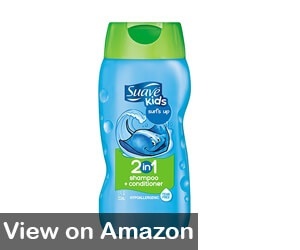 Suave 2 in 1 shampoo helps restore the natural balance of acid mantle in the scalp. Acid mantle barrier helps maintain moisture in the scalp and protects from various scalp skin problems. Mothers have reported that it does a great job at detangling long, fine hair and giving the hair that natural shine. It was also reported to make the hair easy to brush after the bath and makes braiding much faster as the hair becomes manageable. However, it is not recommended to be used on children that are sensitive to Cehami plant. A shampoo designed by a dermatologist to help ease the detangling process, and gently clean the hair on daily basis. The formula was carefully crafted to have an optimal pH balance so as to not distort the natural acidic barrier of the scalp. It’s infused with many beneficial ingredients that hydrate, exfoliate and moisturizes the scalp promoting healthy hair. It does not contain sulfates and parabens that lead to scalp dryness making it suitable for use on children with already dry scalp (Source). It has been certified as a cruelty-free product and relies solely on plant-based ingredients such as sunflower for nourishment, aloe vera for moisturization and lavender for scalp calming effect. All ingredients are grown under supervision and go through further testing once harvested to make sure that they adhere to Jason’s Kids standards. It comes in a large, biodegradable bottle that can be easily opened and closed. Sadly, however, it comes without a pump. If used by children themselves, there is a big chance they might squirt or spill a large amount unnecessary. Nature’s Baby Organics Shampoo lists all the ingredients in an easy to understand manner and are very transparent about their production techniques. They use chemical-free ingredients to produce many of their products, including this shampoo and use bio-degradable packaging. This shampoo is made using organic aloe vera, cucumber extracts and plenty of other botanical ingredients such as chamomile and calendula. For the preservative, they use an NSF approved sodium benzoate and natural fragrances that are derived from flowers and fruits. Moreover, this shampoo does not contain the usual chemical culprits such as parabens, sulfates, SLS and mineral oils. The packaging is also cadmium-free. A small amount of shampoo foams into a creamy, fluffy lather that perfectly cleans tangled hair. The pump makes it easy even for the little ones to squirt out the right amount. The shampoo was reported to be perfect for children with dry, curly and fine hair as it softens and gently cleans without ruining the curls. You can find it in travel size bottle too. 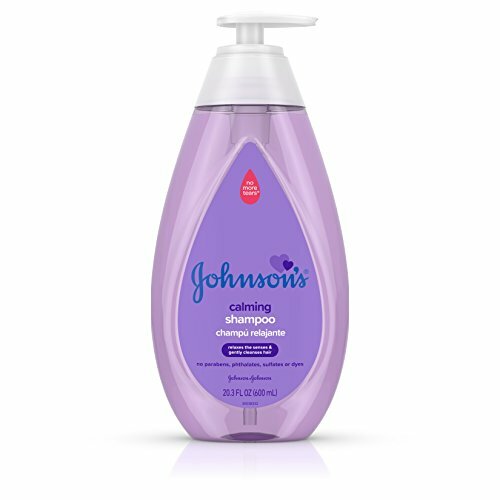 The Johnson’s Baby Tear Free Shampoo still has its popular, bubbly lather and that too familiar scent that, for millions of individuals, reminds us of tender moments of bath time from our childhood memories. 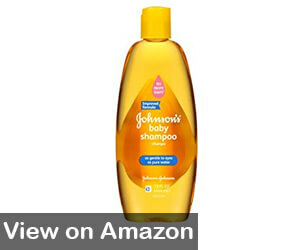 But, recently this Johnson baby shampoo, and over 100 more Johnson’s products have gone through some major changes. It isn’t the case of what was added, but rather what is now missing. In the past decade, consumers became much more aware of the different harmful chemicals that are present in the products we use. Johnson Baby Shampoo came under massive scrutiny by parents worldwide because of two chemicals in its formula; formaldehyde and 1, 4 dioxane. Both were proven to accumulate in the body leading to severe consequences. Johnson’s worked on changing the formula for the last two years. Recently, it introduced its new formula without the harmful ingredients. In addition, the new formula now contains medically-graded glycerin that moisturizes the scalp. 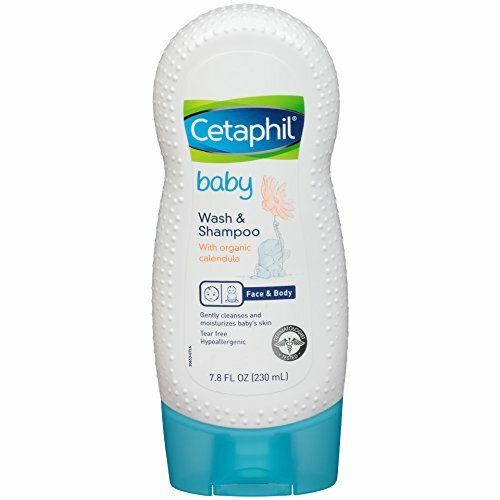 The tear-free formula makes it suitable to be used even with newborns. It leaves the hair smelling fresh, with a natural shine throughout the day. The thick lather cleans the hair and makes it easy to be combed, even if your child has thick, curly hair. Its regular use, combined with messaging the scalp during use can prevent the formation of cradle cap. 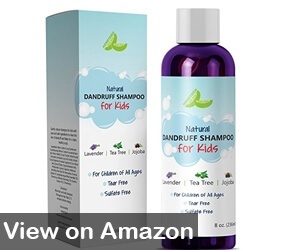 The added glycerin also helps battle dandruff flakes in children prone to itchy and dry skin. Many individuals believe that shampoos are only used on the outside of our body and hence do not cause any harmful effects inside. However, most chemicals are absorbed through the skin pores on the scalp and then travel throughout the body via the bloodstream. A number of chemicals that are used in shampoos are proven to be a carcinogen, meaning they can cause cancer cells in the body. Our advice to you would be to avoid at all costs shampoos that contain sulfates, siloxanes, alcohol, and propylene glycol. On the other hand, chemical- free shampoos usually contain plenty of plant extracts that nourish the scalp and give a healthy shine to the hair while stimulating hair growth by hydrating the hair follicles from within. Plus, natural oils, such as, argan and olive oil prevent scalp dryness and dandruff that forms as a result. Moreover, chemical-free shampoos biodegrade over time and do not cause much harm to our environment. Keep in mind that our babies will inherit the environment we sustained. The common rule of thumb is that natural shampoos do not contain more than 10 ingredients; any additional ones are likely to be synthetic preservatives and colorants. Some of the beneficial ingredients in kids shampoo to look for are aloe vera, glycerin, coconut oil, shea butter, and lavender with tea tree extracts that have soothing and anti-bacterial properties. Natural shampoos are beneficial to the children because they tend to fill the hair follicles with vitamins, minerals and organic oils. The scalp skin benefits from these ingredients as it avoids becoming dry and patchy. Tea tree oils help the scalp stir clear of redness, itchiness and flaking. A commonly added ingredient, the beta-glucan, does the same job only much more effectively. On the other hand, small children might benefit from aloe vera juice and pure coconut oil as they do a good job at moisturizing the scalp and aiding the growth of hair follicles. Shea butter gives the little ones hair that natural, beautiful shine. Most natural shampoos have lavender extract in them; it is because lavender is a multi-purpose ingredient as it hydrates the skin and calms the nerves. Honey and Peppermint essential oil is often added for its anti-bacterial properties, it also stimulates blood flow to the scalp aiding in skin regeneration. Furthermore, keratin helps strengthen the hair strands giving them more texture and does a good job at repairing the hair damage that occurs due to constant braiding in small children. Calendula and Chamomile are used to soften dry and frizzy hair in small children, especially in children of African American race. Aloe vera, coconut and olive oil are added to best kids shampoo for nourishment and moisturization. Lastly, orange and lemon extracts or essential oil are added to provide the scalp with much needed vitamin C; a critical component for healthy scalp. On the darker side, the health hazards from using chemical based shampoo have been outlined at the beginning of this article and we hope you will take them to heart. In our bit to provide only the best for our children, we might start feeling confused as to what product might be best for our children. We often think that the more expensive the product is, the better it is for their health. However, that is not the case always. Our best advice to you would be to spend more time reading the shampoo labels carefully when shopping to determine whether the product contains the harmful chemical ingredients mentioned above. If yes, look for an alternative. To make this step easy and quick to follow, brush yourself with the common “bad” and “good” ingredients. Plus, avoid all products that have genetically modified crops and plants in them because scientists have not been able to tell yet whether they can cause harm to our health. The popular belief is that genetically modified crops, such as rice and wheat, that often added as extracts to shampoos can have a negative effect that will become visible only after a long period of time. They are believed to have a so-called accumulating effect.